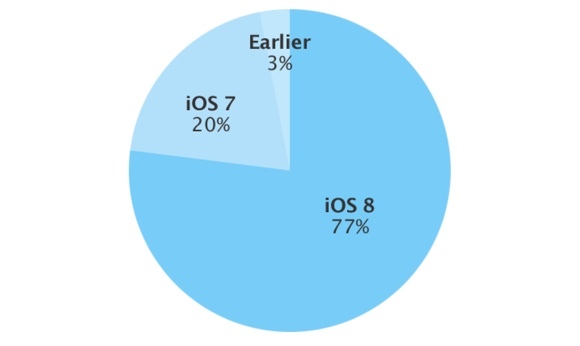 More than three quarters of all compatible devices now run Apple iOS 8. As of March 16, the adoption of the Cupertino giant’s latest mobile OS has reached 77%. Apple’s App Store Distribution dashboard reveals that iOS 7 is still booting on 20% of all the company’s active mobile hardware. The remaining 3% is reserved for iOS 6 earlier builds of the platform. There is no information on the specific adoption of iOS 8’s various versions. Apple has pushed several major updates to the platform since its release, with iOS 8.2 last week being the latest one. The latest data from Apple reveals that iOS 8 adoption has jumped 4% since mid-February. However, compared to iOS 7 and its 90% adoption this time last year, iOS 8 still has a way to go to catch up. The slower adoption of iOS 8 should hardly catch anyone by surprise. The early variations of the OS carried a number of bugs, which slowed down the upgrade cycle. Apple will reportedly focus mostly on performance and stability upgrades for its next major release of the platform - iOS 9. However, compared to the adoption of the latest Android version by Google, Apple is doing a lot better. As of early March, Android 5.0 Lollipop runs on 3.3% of all hardware.